The present invention relates to a probe and a probe set for detecting a gene of infectious disease pathogenic bacterium, Prevotella denticola, which are useful for detection and identification of the causative organism of an infectious disease, a probe-immobilized carrier on which the probe or the probe set is immobilized, a genetic testing method using the probe-immobilized carrier, and a genetic testing kit to be used for the method. Heretofore, reagents for and methods of quickly and accurately detecting the causative organisms of infectious diseases in analytes have been proposed. For instance, Japanese Patent Application Laid-Open No. H08-089254 discloses oligonucleotides having specific base sequences, which can be respectively used as probes and primers for detecting pathogenic bacteria of candidiasis and aspergillosis, and a method of detecting target bacteria using such oligonucleotides. In addition, the same patent document also discloses a set of primers used for concurrently amplifying a plurality of target bacteria by PCR. In other words, those primers are used for the PCR amplification of nucleic acid fragments from fungi, which serve as a plurality of targets, in an analyte. Target fungal species in the analyte can be identified by detecting the presence of a specific part of the sequence by a hybridization assay using probes specific to the respective fungi and the nucleic acid fragments amplified by the respective primers. However, it is no easy task to design a probe for specifically detecting a gene of an infectious disease pathogenic bacterium in a sample. That is, as well as the target gene, the sample may further contain genes of other infectious disease pathogenic bacteria. Thus, it is no easy task to design the probe that specifically detects the gene of the infectious disease pathogenic bacterium while suppressing the cross contamination which is the influence of the presence of the genes of other infectious disease pathogenic bacteria. Under such circumstances, the inventors of the present invention have studied for obtaining a probe which allows accurate detection of a gene of an infectious disease pathogenic bacterium as mentioned hereinbelow while maintaining the cross contamination level low even when a sample in which genes of different bacteria are present is used. As a result, the inventors of the present invention have finally found a plurality of probes capable of precisely detecting the gene of the infectious disease pathogenic bacterium, Prevotella denticola. A first object of the present invention is to provide a probe and a probe set, which can precisely identify a gene of a target bacterium from an analyte in which various bacteria are concurrently present. Another object of the present invention is to provide a probe-immobilized carrier which can be used for precisely identifying a target bacterium from an analyte in which various bacteria are concurrently present. Still another object of the present invention is to provide a genetic testing method for detecting a target bacterium, which can quickly and precisely detect the target bacterium from various bacteria in an analyte when they are present therein, and a kit for such a method. These objects are achieved by the probe according to claim 1, the probe set according to claim 8, the probe-immobilized carriers according to claims 3 and 10, the detection kits according to claims 5 and 7, and the detection method according to claim 12. The other claims relate to further developments. According to the present invention, when an analyte is infected with the above-mentioned causative bacterium, the bacterium can be more quickly and precisely identified from the analyte even if the analyte is simultaneously and complexly infected with other bacteria in addition to the above-mentioned bacterium. In particular, Prevotella denticola can be detected while precisely distinguishing it from Escherichia coli which may otherwise cause cross contamination. FIG. 1 is a diagram illustrating a 1st PCR protocol. FIG. 2 is a diagram illustrating a 2nd PCR protocol. The inventors of the present invention have obtained almost all of bacteria (represented by (1) to (80) below), which have been known as septicemia pathogenic bacteria so far, from the respective depository institutions and identified the 16S rRNA gene sequences of all the bacteria. Subsequently, while making a comparison of all the identified sequence, probe sequences for Prevotella denticola were investigated in detail and the probes of the present invention, which can identify Prevotella denticola, have finally been found out. The deposition numbers of the bacterial species obtained are shown in the respective parentheses on the right side in the above. Bacterial species having deposition numbers beginning with "ATCC", "JCM" and "NBRC" are available from American Type Culture Collection, Japan Collection of Microorganisms (RIKEN BioResource Center) and National Board for Respiratory Care, respectively. The present invention provides an oligonucleotide probe for identifying an infectious disease pathogenic bacterium (hereinafter, simply referred to as a probe) and a probe set including a combination of two or more probes. The use of such a probe or a probe set allows the detection of the following bacterium which will cause inflammation by infection. (H) a probe having a modified sequence obtained by base deletion, substitution, or addition on the complementary sequence of the base sequence represented by SEQ ID NO. 71 as far as it retains the function of a probe for detecting the gene of Prevotella denticola. The probe set can be formed using at least two of those probes. The functions of those probes significantly depend on the specificity of each probe sequence corresponding to the target nucleic acid sequence of interest. The specificity of a probe sequence can be evaluated from the degree of coincidence of bases with the target nucleic acid sequence and the probe sequence. Further, when a plurality of probes constitute a probe set, the variance of melting temperatures among the probes may affect the performance of the probe set. For designing a probe sequence, a region showing a high specificity to a specific bacterial species of interest regardless of any differences in strain is selected. The region contains three or more bases which are not coincident with corresponding bases in the sequences of any other bacterial species. The probe sequence is designed so that the melting temperature between the probe sequence and the corresponding sequence of the specific bacterial species of interest will differ by 10°C or more from the melting temperatures between the probe sequence and the corresponding sequences of any other bacterial species. Further, one or more bases can be deleted or added so that the respective probes immobilized on a single carrier may have melting temperatures within a predetermined range. The inventors of the present invention found out by experiments that the hybridization intensity of a probe will not be significantly attenuated if 80% or more of the base sequence is consecutively conserved. It can therefore be concluded, from the finding, such that any sequences modified from the probe sequences disclosed in the specification will have a sufficient probe function if 80% or more of the base sequence of the probe is consecutively conserved. The above-mentioned modified sequences may include any variation as far as it does not impair the probe's function, or any variation as far as it hybridizes with a nucleic acid sequence of interest as a detection target. Above all, it is desirable to include any variation as far as it can hybridize with a nucleic acid sequence of interest as a detection target under stringent conditions. Preferable hybridization conditions confining the variation include those represented in examples as described below. Here, the term "detection target" used herein may be one included in a sample to be used in hybridization, which may be a unique base sequence to the infectious disease pathogenic bacterium, or may be a complementary sequence to the unique sequence. Further, the variation may be a modified sequence obtained by deletion, substitution, or addition of at least one base as far as it retains a function as the probe. Those probe sequences are only specific to the DNA sequence coding for the 16S rRNA of the above-mentioned bacterium, so sufficient hybridization sensitivity to the sequence will be expected even under stringent conditions. In addition, any of those probe sequences forms a stable hybridized product through a hybridization reaction thereof with a target analyte even when the probe sequences are immobilized on a carrier, which is designed to produce an excellent result. Further, a probe-immobilized carrier (e.g., DNA chip), on which the probe for detecting the infectious disease pathogenic bacterium of the present invention, can be obtained by supplying the probe on a predetermined position on the carrier and immobilizing the probe thereon. Various methods can be used for supplying the probe to the carrier. Among them, for example, a method, which can be suitably used, is to keep a surface state capable of immobilizing the probe on the carrier through a chemical bonding (e.g., covalent bonding) and a liquid containing the probe is then provided on a predetermined position by an inkjet method. Such a method allows the probe to be hardly detached from the carrier and exerts an additional effect of improving the sensitivity. In other words, when a stamping method conventionally used and called the Stanford method is employed to make a DNA chip, the resultant DNA chip has a disadvantage such that the applied DNA tends to be peeled off. Another one of the methods of forming DNA chips is to carry out the arrangement of probes by the synthesis of DNA on the surface of a carrier (e.g., DNA chip from Affymetrix Co., Ltd.). In such a method of synthesizing probes on a carrier, it is difficult to make equal the amount of synthesized DNA for each probe sequence. Thus, the amount of immobilized probe per immobilization area (spot) for each probe tends to vary considerably. Such variations in amounts of the respective immobilized probes may cause incorrect evaluation on the results of the detection with those probes. Based on this fact, the probe carrier of the present invention is preferably prepared using the above-mentioned inkjet method. The inkjet method as described above has an advantage such that the probe can be stably immobilized on the carrier and hardly detaching from the carrier to efficiently provide a probe carrier which can carry out detection with high sensitivity and high accuracy. In addition, a probe set may include at least two selected from the group consisting of SEQ ID NOS. 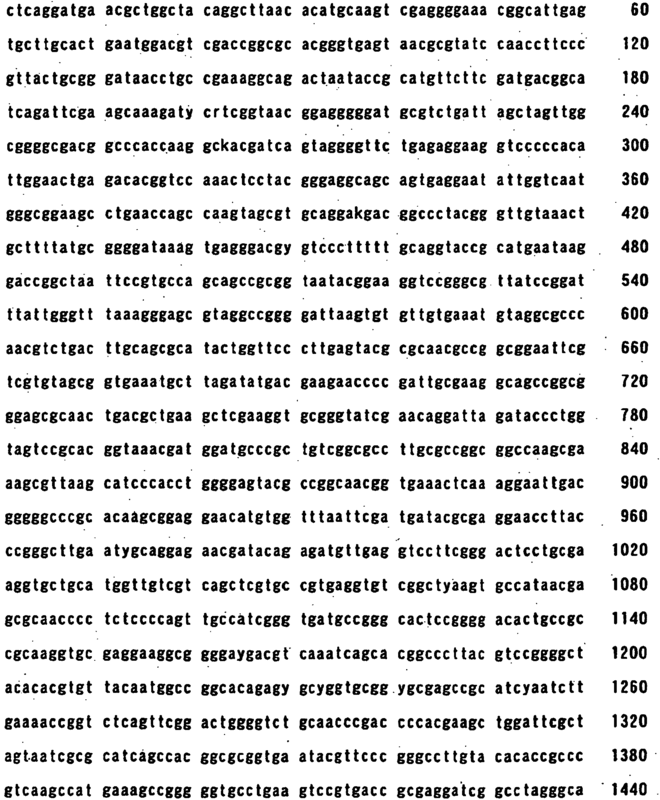 70 to 71 as described above and the complementary sequences thereof and sequences obtained by base deletion, substitution, or addition on those sequences as far as they retain the function of a probe for detecting the gene of Prevotella denticola. In this case, the accuracy of detecting the Prevotella denticola gene can be further improved. Hereinafter, preferred embodiments of the present invention will be described in detail. Test objects to be tested using probe carriers (e.g., DNA chips) in which the probes of the present invention are immobilized on carriers include those originated from humans and animals such as domestic animals. For example, a test object is any of those which may contain bacteria, including: any body fluids such as blood, cerebrospinal fluid, expectorated sputum, gastric juice, vaginal discharge, and oral mucosal fluid; and excretions such as urine and feces. All media, which can be contaminated with bacteria, can be also subjected to a test using a DNA chip. Such media include: flood, drink water and water in the natural environment such as hot spring water, which may cause food poisoning by contamination; filters of air cleaners and the like; and so on. Animals and plants, which should be quarantined in import/export, are also used as analytes of interest. (a) An amplified analyte prepared by using a PCR-reaction primer designed for detecting 16S rRNA gene. (b) An amplified analyte prepared by an additional PCR reaction or the like from a PCR-amplified product. (c) An analyte prepared by an amplification method other than PCR. (d) An analyte labeled for visualization by any of various labeling methods. Further, a carrier used for preparing a probe-immobilized carrier, such as a DNA chip, may be any of those that satisfy the property of carrying out a solid phase/liquid phase reaction of interest. Examples of the carrier include: flat substrates such as a glass substrate, a plastic substrate, and a silicon wafer; a three-dimensional structure having an irregular surface; and a spherical body such as a bead, and rod-, cord-, and thread-shaped structures. The surface of the carrier may be processed such that a probe can be immobilized thereon. Especially, a carrier prepared by introducing a functional group to its surface to enable chemical reaction has a preferable form from the viewpoint of reproducibility because the probe is stably bonded in the process of hybridization reaction. Various methods can be employed for the immobilization of probes. An example of such a method is to use a combination of a maleimide group and a thiol (-SH) group. In this method, a thiol (-SH) group is bonded to the terminal of a probe, and a process is executed in advance to make the carrier (solid) surface have a maleimide group. Accordingly, the thiol group of the probe supplied to the carrier surface reacts with the maleimide group on the carrier surface to form a covalent bond, whereby the probe is immobilized. Introduction of the maleimide group can utilize a process of firstly allowing a reaction between a glass substrate and an aminosilane coupling agent and then introducing a maleimide group onto the glass substrate by a reaction of the amino group with an EMCS reagent (N-(6-maleimidocaproyloxy)succinimide, available from Dojindo). Introduction of the thiol group to a DNA can be carried out using 5'-Thiol-Modifier C6 (available from Glen Research) when.the DNA is synthesized by an automatic DNA synthesizer. Instead of the above-described combination of a thiol group and a maleimide group, a combination of, e.g., an epoxy group (on the solid phase) and an amino group (nucleic acid probe terminal), can also be used as a combination of functional groups to be used for immobilization. Surface treatments using various kinds of silane coupling agents are also effective. A probe in which a functional group which can react with a functional group introduced by a silane coupling agent is introduced is used. A method of applying a resin having a functional group can also be used. (iii) specifying the probe having reacted with the nucleic acid in the analyte when the reaction of the probe with the nucleic acid in the analyte is detected and specifying the gene of the infectious disease pathogenic bacterium in the analyte based on the nucleic acid sequence of the probe. The probe to be immobilized on the probe-immobilized carrier is at least one of the above-mentioned items (A) to (L). On the carrier, probes for detecting bacterial species other than Prevotella denticola may be immobilized as other probes, depending on the purpose of test. In this case, the other probes may be those capable of detecting the bacterial species other than Prevotella denticola without causing cross contamination and the use of such probes allows simultaneous detection of a plurality of bacterial species with high accuracy. (28) an oligonucleotide having a base sequence of 5' atccagccgcacgttcccgtac 3' (SEQ ID NO: 28). (25) an oligonucleotide having a base sequence of 5' atccagccgcaccttccggtac 3' (SEQ ID NO: 25). For detecting Prevotella denticola, at least such a primer may be included. The utilities of the respective primers (1) to (28) for amplification of Prevotella denticola (ATCC 38184) can be evaluated and confirmed by comparing each sequence of SEQ ID NOs. 1 to 28 with a DNA sequence including the 16S rRNA coding region of Prevotella denticola (SEQ ID NO. 95). A kit for detecting the infectious disease pathogenic bacterium can be constructed using at least a probe as described above and a reagent for detecting a reaction of the probe with a nucleic acid in an analyte. The probe in the kit can preferably be provided as a probe-immobilized carrier as described above. Further, the detection reagent may contain a label to detect the reaction or a primer for carrying out amplification as a pre-treatment. Hereinafter, the present invention will be described in more detail with reference to examples using probes for detecting an infectious disease pathogenic bacterium to detect Prevotella denticola. In this example, microorganism detection using 2-step PCR will be described. For each probe having a base sequence shown in Table 1, a thiol group was introduced, as a functional group to immobilize the probe on a DNA chip, to the 5' terminal of the nucleic acid after synthesis in accordance with a conventional method. After introduction of the functional group, purification and freeze-drying were executed. The freeze-dried probes for internal standard were stored in a freezer at -30°C. The primers shown in Table 2 were purified by high performance liquid chromatography (HPLC) after synthesis. The twenty-one forward primers and the seven reverse primers were mixed and dissolved in a TE buffer solution such that each primer concentration had an ultimate concentration of 10 pmol/µl. The primers shown in Table 3 were labeled with a fluorescent dye, Cy3. The primers were purified by high performance liquid chromatography (HPLC) after synthesis. The six labeled primers were mixed and dissolved in a TE buffer solution such that each primer concentration had an ultimate concentration of 10 pmol/µl. First, Prevotella denticola (ATCC 38184) was cultured in accordance with the conventional method. This microbial culture medium was subjected to the extraction and purification of genome DNA by using a nucleic acid purification kit (FastPrep FP100A FastDNA Kit, manufactured by Funakoshi Co., Ltd.). The collected genome DNA of the microorganism, Prevotella denticola, was subjected to agarose electrophoresis and 260/280-nm absorbance determination in accordance with the conventional method. Thus, the quality (the admixture amount of low molecular nucleic acid and the degree of decomposition) and the collection amount were tested. In this example, about 10 µg of the genome DNA was collected. No degradation of genome DNA or contamination of rRNA was observed. The collected genome DNA was dissolved in a TE buffer solution at an ultimate concentration of 50 ng/µl and used in the following experiments. A glass substrate (size: 25 mm × 75 mm × 1 mm, available from Iiyama Precision Glass) made of synthetic quartz was placed in a heat- and alkali-resisting rack and dipped in a cleaning solution for ultrasonic cleaning, which was adjusted to have a predetermined concentration. The glass substrate was kept dipped in the cleaning solution for a night and cleaned by ultrasonic cleaning for 20 min. The substrate was picked up, lightly rinsed with pure water, and cleaned by ultrasonic cleaning in ultrapure water for 20 min. The substrate was dipped in a 1N aqueous sodium hydroxide solution heated to 80°C for 10 min. Pure water cleaning and ultrapure water cleaning were executed again. A quartz glass substrate for a DNA chip was thus prepared. A silane coupling agent KBM-603 (available from Shin-Etsu Silicone) was dissolved in pure water at a concentration of 1% by weight (wt%) and stirred at room temperature for 2 hrs. The cleaned glass substrate was dipped in the aqueous solution of the silane coupling agent and left stand still at room temperature for 20 min. The glass substrate was picked up. The surface thereof was lightly rinsed with pure water and dried by spraying nitrogen gas to both surfaces of the substrate. The dried substrate was baked in an oven at 120°C for 1 hr to complete the coupling agent treatment, whereby an amino group was introduced to the substrate surface. Next, N-maleimidocaproyloxy succinimido (abbreviated as EMCS hereinafter) was dissolved in a 1:1 (volume ratio) solvent mixture of dimethyl sulfoxide and ethanol to obtain an ultimate concentration of 0.3 mg/ml. As a result, an EMCS solution was prepared. Here, EMCS is N-(6-maleimidocaproyloxy)succinimido available from Dojindo. The baked glass substrate was left stand and cooled and dipped in the prepared EMCS solution at room temperature for 2 hrs. By this treatment, the amino group introduced to the surface of the substrate by the silane coupling agent reacted with the succinimide group in the EMCS to introduce the maleimide group to the surface of the glass substrate. The glass substrate picked up from the EMCS solution was cleaned by using the above-described solvent mixture in which the EMCS was dissolved. The glass substrate was further cleaned by ethanol and dried in a nitrogen gas atmosphere. An aqueous solution containing 7.5-wt% glycerin, 7.5-wt% thiodiglycol, 7.5-wt% urea, and 1.0-wt% Acetylenol EH (available from Kawaken Fine Chemicals) was prepared. Each of the three probes (Table 1) prepared in advance was dissolved in the solvent mixture at a specific concentration. An ink tank for an inkjet printer (trade name: BJF-850, available from Canon) is filled with the resultant DNA solution and attached to the printhead. The inkjet printer used here was modified in advance to allow printing on a flat plate. When a printing pattern is input in accordance with a predetermined file creation method, a about 5-picoliter of a DNA solution can be spotted at a pitch of about 120 µm. Amplification reaction of the reaction solution having the above-mentioned composition was carried out using a commercially available thermal cycler in accordance with the protocol illustrated in FIG. 1. After the end of reaction, the primer was purified using a purification column (QIAquick PCR Purification Kit available from QIAGEN). Subsequently, the quantitative assay of the amplified product was carried out. After the end of reaction, the primer was purified using a purification column (QIAquick PCR Purification Kit available from QIAGEN) to obtain a labeled analyte. Detection reaction was performed using the DNA chip prepared in the stage 4 (Preparation of DNA Chip) and the labeled analyte prepared in the stage 5 (Amplification and Labeling of Analyte). Bovine serum albumin (BSA, Fraction V: available from Sigma) was dissolved in a 100-mM NaCl/10-mM phosphate buffer such that a 1 wt % solution was obtained. Then, the DNA chip prepared in the stage 4 (Preparation of DNA Chip) was dipped in the solution at room temperature for 2 hrs to execute blocking. After the end of blocking, the chip was cleaned using a washing solution as described below, rinsed with pure water and hydro-extracted by a spin dryer. The hydro-extracted DNA chip was placed in a hybridization apparatus (Hybridization Station available from Genomic Solutions Inc). Hybridization reaction was carried out in a hybridization solution under conditions as described below. 65°C for 3 min, 55°C for 4 hrs, washing with 2 x SSC/0.1% SDS at 50°C, washing with 2 x SSC/0.1% SDS at 20°C (rinse with H2O: manual), and spin dry. As is evident from the above description, a DNA chip was prepared such that a probe set, which was able to detect only Prevotella denticola in a specific manner, was immobilized. Further, the use of such a DNA chip allowed the identification of an infectious disease pathogenic bacterium, so the problems of the DNA probe derived from a microorganism was able to be solved. In other words, the oligonucleotide probe can be chemically produced in large amounts, while the purification or concentration thereof can be controlled. In addition, for classification of microbial species, a probe set capable of collectively detecting bacterial strains of the same genus and differentially detecting them from bacteria of other genera, was able to be provided. Further, in addition to Escherichia coli as described above, hybridization reaction was carried out on each of nucleic acids extracted from the bacteria represented in the above-mentioned items (1) to (80). The results thereof confirmed that no substantial reaction was observed with respect to each of those bacteria in a manner similar to that of Escherichia coli, except of Prevotella denticola. The bacteria represented in the above-mentioned items (1) to (80) are pathogenic bacteria for septicemia, and they cover almost all of the pathogenic bacteria ever detected in human blood. Therefore, by using the primer of the present embodiment, the nucleic acid of an infections disease pathogenic bacterium in blood can be extracted and then subjected to hybridization reaction with the probe of the present invention, whereby identification of Prevotella denticola can be performed with higher accuracy. Further, according to the above-mentioned example, the presence of an infectious disease pathogenic bacterium can be efficiently determined with high accuracy by completely detecting the 16S rRNA gene from the gene of the infectious disease pathogenic bacterium. Bacterial species (or genus) of interest Probe sequence (5'→3') SEQ ID NO. Those probes are capable of specifically detecting certain bacterial species (or genera) shown in the left column in the table just as one specific to Prevotella denticola of Example 1. Further, those probes are designed such that they have the same Tm value as that of a target, the same reactivity with a non-target sequence, and the like so that the nucleic acid of the bacterial species of interest can be specifically detected under the same reaction conditions. For the respective probes, probe solutions were prepared in a manner similar to the stage 4-3 of Example 1. Subsequently, the inkjet printer used in the stage 4-4 of Example 1 was employed to discharge each of the probe solution on the same substrate to form a plurality of DNA chips having spots of the respective probes being arranged at a pitch of about 120 µm. One of the DNA chips was used for hybridization with the nucleic acid extracted from Prevotella denticola in a manner similar to the stage 6 of Example 1. As a result, the spot of the probe which specifically detected Prevotella denticola showed almost the equal fluorescence intensity as that of Example 1. In contrast, the spots of other probes showed extremely low fluorescence intensity. Using the DNA chip prepared in Example 2, detection was attempted when a plurality of bacterial species was present in an analyte. A culture medium in which Prevotella denticola and Eggerthella lenta were cultured was prepared and subjected to the same treatment as that of Example 1 to react with the DNA chip. As a result, only the spots of the probes having SEQ ID NOS. 49, 50, 51, 70, 71, and 72 (reference example) showed high fluorescence intensity, so the coexistence of those bacteria was able to be simultaneously confirmed. To apprise the public of the scope of the present invention, the following claims are made. (3) a modified sequence of a length of 20 to 30 nucleotides and prepared such that any one of the sequences of SEQ ID NOS. 70 to 71 and the complementary sequences thereof is subjected to base deletion, substitution, or addition as far as 80% or more of the base sequence is consecutively conserved and as far as the modified sequences hybridize with said bacterium under the following stringent conditions: Hybridization Solution: 6 × SSPE/10% formamide/target/0.05 wt% (6 × SSPE: NaCl 900 mM, NaH2PO4H2O 50 mM, EDTA 6 mM, pH, 7.4); Hybridization Conditions: 65°C for 3 min, 55°C for 4 hrs, washing with 2 × SSC/0.1% SDS at 50°C, washing with 2 × SSC/0.1% SDS at 20°C. The probe according to claim 1, wherein for each of said base sequences SEQ ID NOS. 70 to 71, the melting temperature between the probe sequence and the corresponding sequence of the gene of said infectious bacterium under said stringent conditions is by at least 10°C higher than the melting temperature between the same probe sequence and any gene sequence of any other infectious bacterium selected from the group of 80 bacteria (1) to (80) listed in Table 2 of the description under said stringent conditions. A probe-immobilized carrier, wherein at least one first probe according to claim 1 is arranged on a solid-phase carrier. A probe-immobilized carrier according to claim 3, wherein the probe-immobilized carrier comprises at least one second probe having any one of the base sequences of SEQ ID NOS. 35 to 94 as mentioned in the specification immobilized at a position spaced from the first probe. a reagent for detecting a reaction between the probe and a target nucleic acid. (K) a probe wherein the base sequence is a modified sequence with a length of 20 to 30 nucleotides, obtained by base deletion, substitution, or addition on the complementary sequence of the base sequence represented by SEQ ID NO. 71 as far as 80% or more of the complementary sequence is consecutively conserved and as far as the modified sequence retains the function of a probe for detecting the gene of Prevotella denticola under the following stringent conditions: Hybridization Solution: 6 x SSPE/10% formamideltarget/0.05 wt% (6 × SSPE: NaCl 900 mM, NaH2PO4H2O 50 mM, EDTA 6 mM, pH, 7.4); Hybridization Conditions: 65 °C for 3 min, 55 °C for 4 hrs, washing with 2 x SSC/0.1% SDS at 50°C, washing with 2 × SSC/0.1 % SDS at 20°C; and. wherein one of said at least two probes is a probe according to claim 1. (3) ATGTTGAGGTCCTTCGGGACTCCT (SEQ ID NO. 72). A probe-immobilized carrier, comprising a plurality of first probes constituting the probe set according to claim 8, wherein the plurality of first probes are arranged on a solid-phase carrier at intervals from each other. A probe-immobilized carrier according to claim 10, wherein the probe-immobilized carrier comprises at least one second probe having any one of the base sequences of SEQ ID NOS. 35 to 94 as mentioned in the specification immobilized at a position spaced from the plurality of first probes. (ii) detecting the presence or absence of a reaction of the probe on the probe-immobilized carrier with a nucleic acid in the analyte, or detecting the strength of a hybridization reaction of the probe on the probe-immobilized carrier with a nucleic acid in the analyte. (25) an oligonucleotide having a base sequence of 5' atccagccgcaecttccggtac 3' (SEQ ID NO: 25). Sachse et al. 2005 DNA microarray-based detection and identification of Chlamydia and Chlamydophila spp.